Published: July 25, 2014 at 02:30 p.m. Updated: July 25, 2014 at 02:58 p.m. Improvement in two critical areas could have Brett Hundley rapidly rising up draft boards. Whenever a college coach with strong NFL ties suggests that one of his players has the goods to be a star at the next level, NFL scouts and coaches take notice. That's why there is a bit of a buzz brewing in league circles after UCLA head coach Jim Mora heaped lavish praise on his star quarterback, Brett Hundley. Now, I'm certainly in agreement with Mora on his assessment of his star quarterback's potential after watching him closely during his spectacular sophomore campaign. 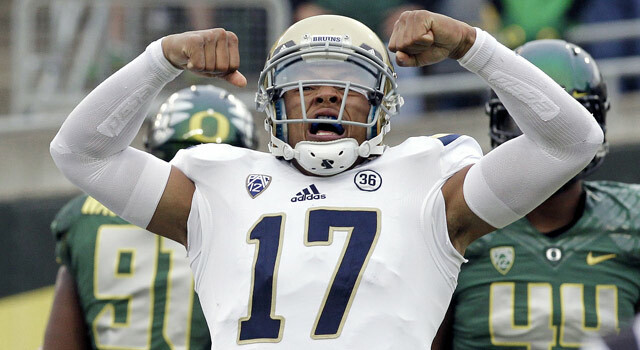 Hundley is a new-school quarterback with the polished pocket-passing skills that traditionalists covet and the dynamic running skills that innovative coordinators relish in a dual-threat playmaker at the position. With a wave of athletic quarterbacks like Russell Wilson, Colin Kaepernick, Cam Newton and -- to a lesser extent -- Andrew Luck terrorizing the league with their unique combination of skills as run-pass threats, there is a place in the NFL for a talented playmaker like Hundley to make his mark as a franchise quarterback. But the UCLA star must improve in two critical areas -- game management and deep-ball accuracy -- to make Mora's prediction of a first-round NFL draft selection come to fruition. I outlined those areas in a piece that I penned near the end of the regular season when I suggested Hundley would benefit from an additional year in Westwood; I think it's important for the redshirt junior to work diligently on those areas to make a move to the top of the charts on draft boards across the league. Thus, I'm encouraged by Hundley's decision to work at the Manning Passing Academy this summer because I know the Manning brothers spend a lot of time mentoring young quarterbacks on the importance of managing the game at the line of scrimmage. From quickly deciphering defensive fronts and coverage prior to the snap to making sound decisions based on his progressions, Hundley needs to continue to make strides. He has to reduce some of the questionable decisions that resulted in turnovers and consistently keep his offense out of harm's way by taking advantage of the soft areas in coverage. 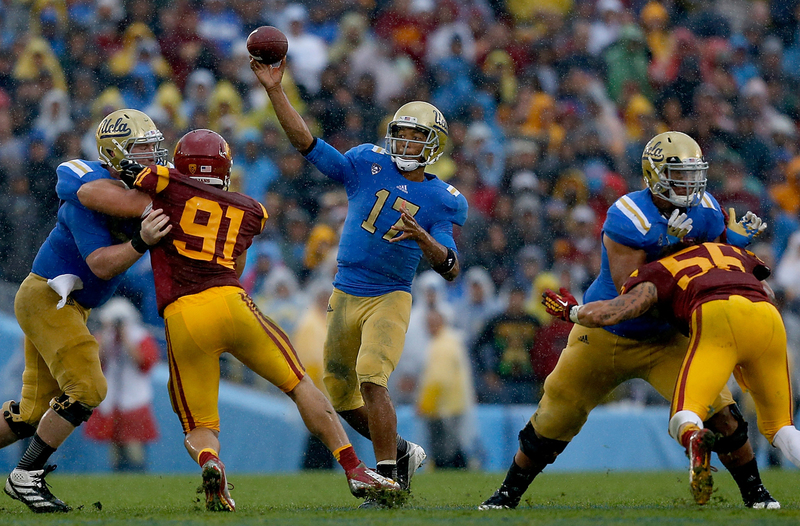 As a passer, Hundley must improve his deep-ball accuracy in 2014. He missed too many downfield shots on fades and go-routes down the boundary a season ago. His balls repeatedly sailed out of bounds on those throws, which prevented the Bruins from cashing in on several home-run opportunities. Given how difficult it is to generate "explosive" plays in the NFL, Hundley's accuracy woes could prevent him from securing the top spot in the 2015 quarterback class, if he elects to forego his senior season. Jim Mora was certainly selling his star quarterback when he touted him as a superstar at Pac-12 Media Days, but Hundley definitely has the goods to make his coach sound like a prophet by season's end.